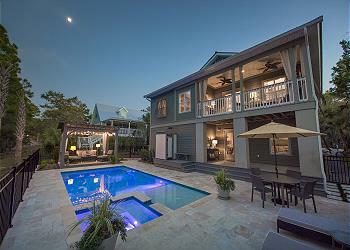 - 45 second bike ride or 3 Minute walk to Seagrove Beach. No Boardwalk or Steps! DETAILS: Luxury Living with Spectacular Ocean Views, Elevator, Two spacious Gulf View decks, Five bedrooms, and open concept inside 30A. A three minute walk or 45 second bike ride to the walk on beach. No steps or Boardwalk to slow you down.No need for a Golf Cart. Community Heated Pool staged by Tresca Lake for additional relaxation. 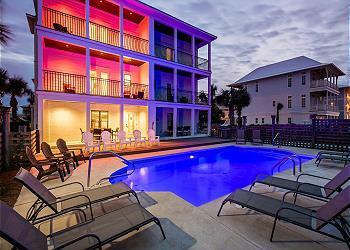 Vacation at” Life is Golden” and enjoy the spectacular views and sounds of the ocean. As you sit in the third floor main living area you are surrounded by the gourmet WOLF Kitchen and dining room that open to a beautiful living room with accordion glass doors that open onto the Gulf View deck. The deck offers comfortable cushioned Frontgate furniture to relax on and you can often hear the crashing waves. Ocean views and sounds can also be enjoyed off the Private Master Suite area located on the entire 4th floor. The sliding glass door offers more of the indoor/outdoor living. Enter the spa like en suite decorated in all carerra marble, large shower with multiple rain shower heads, bench seat and instant hot water, or soak in the beautiful soaking tub. There is also a lighted make-up mirror on the wall. Four other guest bedrooms include timeless decor, en suite bathrooms with lighted make-up mirrors and only one bathroom is shared with the bunk room. Shiplap, entry tile, hardwoods, beautiful white marble throughout, top of the line Rohl fixtures, Wolfe appliances, lots of natural light are just a few of the amenities to enhance your luxury vacation here at “Life is Golden” and make it hard to leave our beautiful paradise. Such a wonderful week at a beautiful home! We were so close to beach and such an easy access into the sand!! The home was very beautifully decorated and we had everything we needed for a peaceful & relaxing week!